Employees using picto selector to create pictosheets for their clients. Picto-Selector has a simple user management system. However for large organizations with many employees it is too much effort to create a Picto-Selector user for all employees. The list with users becomes too big to be manageable. Another issue is that large organizations want to restrict the access of the material to employees working directly with their clients. Often only a few employees are allowed to access the information of a client. Each employee wants his own list of favorites. There are several solutions implemented to use Picto-Selector in large organizations. We will first describe a few possible solutions. 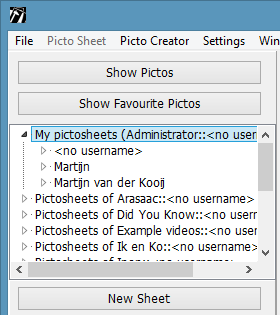 Use the Windows logon name or an environment variable to add an extra user layer in the pictosheet list. The Picto-Selector users become groups and employees logon into a group. In the pictosheet list the Windows logon name is used and only sheets created by the current Windows logon name and without a name will be visible. The group right “Do not use the Windows logon name” is available to ignore the Windows Logon name for a group like it always does for the Administrator group. As a normal group only the owned sheets can be changed. When editing a pictosheet without Windows Logon user a copy will be made when saving the sheet. As administrator all Windows Logon users are made visible and all pictosheets can be edited without changing ownership. It is also possible to use an Environment variable “PICTOUSER” to set the logon name. Favorites are stored for each Windows Logon name. This solution is useful when you have a lot of employees who do not have the need to share their work with colleagues for clients. 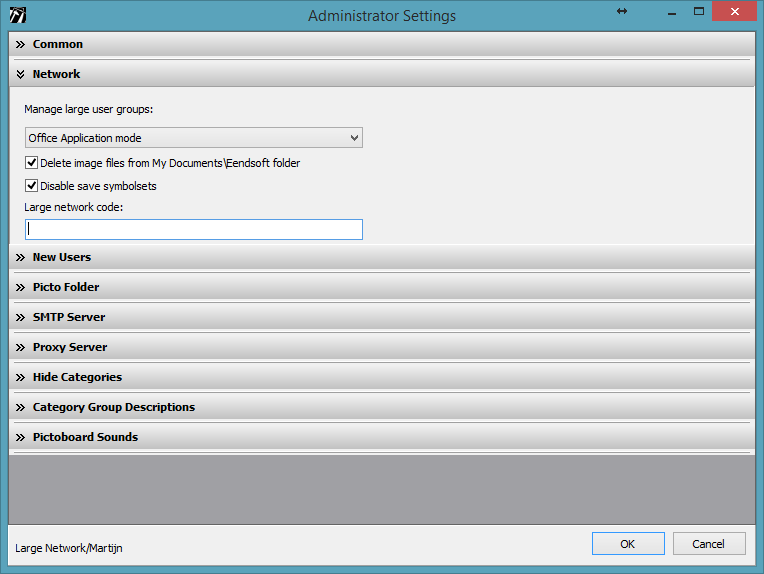 Disable saving pictosheets to the database and show options to save the pictosheets to the file system. Or open a pictosheet from a selectable file location. 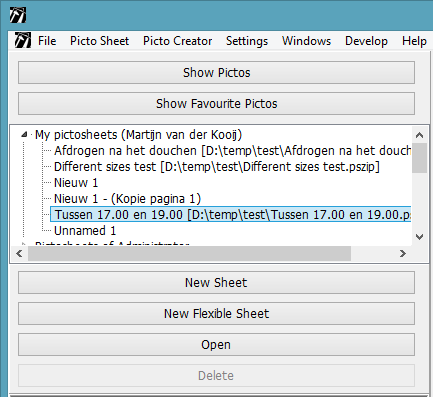 Pictosheets are stored as .pszip files containing 1 sheet. 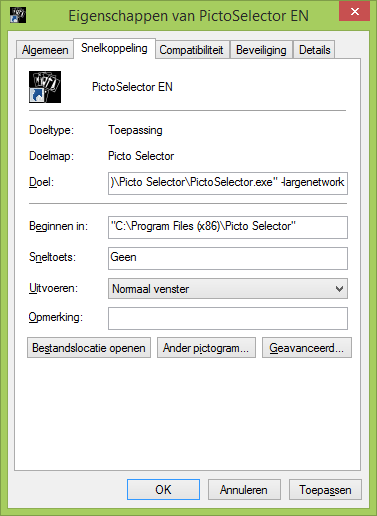 Picto-Selector is started when a Windows user performs a doubleclick on a .pszip file. When opening or importing pictosheets they are never saved to the database unless you log on as Administrator or with a user that has a special “Allow saving to database” right. Opened pictosheets are shown in the list and it is easy to switch between them. 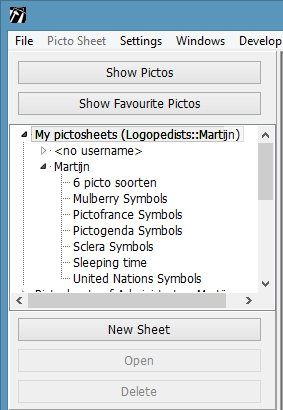 When closing the pictosheet editor (for instance when the application is exited) all changed pictosheets will be saved with the name they had when opened. Newly created sheets can be saved to a selected location. This solution is useful when you have a lot of employees who need to share their work with colleagues because they work for the same clients. You are only allowed to use this when you have a service agreement with MC van der Kooij. In return you are allowed to use those solutions in your organization. You need to insert a large network code to enable the option. You can request a code by MC van der Kooij and is provided to organizations with a service license agreement.